For a complete list of available command-line options, see the ps(1) manual page. Table 24.1, “Interactive top commands” contains useful interactive commands that you can use with top. For more information, see the top(1) manual page. Enter, Space Immediately refreshes the display. h, ? Displays a help screen. k Kills a process. You are prompted for the process ID and the signal to send to it. n Changes the number of displayed processes. You are prompted to enter the number. u Sorts the list by user. M Sorts the list by memory usage. P Sorts the list by CPU usage. q Terminates the utility and returns to the shell prompt. To start the System Monitor tool, either select Applications → System Tools → System Monitor from the panel, or type gnome-system-monitor at a shell prompt. Then click the Processes tab to view the list of running processes. 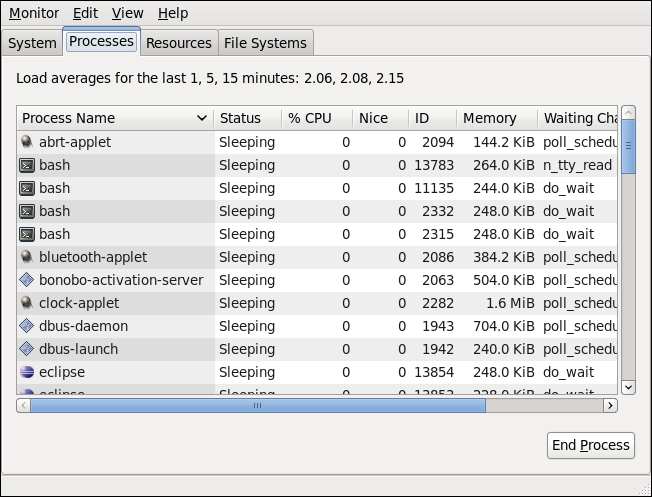 For each listed process, the System Monitor tool displays its name (Process Name), current status (Status), percentage of the CPU usage (% CPU), nice value (Nice), process ID (ID), memory usage (Memory), the channel the process is waiting in (Waiting Channel), and additional details about the session (Session). To sort the information by a specific column in ascending order, click the name of that column. Click the name of the column again to toggle the sort between ascending and descending order.